Is your manual pump dishwasher safe? All of the parts in the manual pump are dishwasher safe. To be extra cautious, we recommend hand washing the white valve, silicone diaphragm stem and the ComfortSeal Cushion to prevent loss and to extend their usefulness. All of the manual pump parts are available for free replacement except for the bottles and the flange part through our customer service department at 1 800 292 4794 . Do I have to use the ComfortSeal cushion? Can I use it with your electric pump? While you dont have to use the ComfortSeal Cushion, it was designed in order to help you create a strong, solid seal which will aid greatly while pumping your milk with this manual pump. 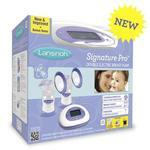 If you find that it is easier or more comfortable to use the pump without the cushion, you can pump that way. 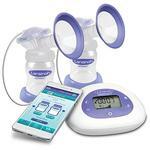 The ComfortSeal Cushion fits on the standard size flange of our Double Electric Breast Pump. Can I use your bags to pump into from the manual pump? Because our bags have a double zipper closure, they will not fit directly on either of our breast pumps. Is there a warranty on this pump? The Manual Pump does not come with a warranty. Please call customer service at 1 800 292 4794 if you have any other questions. 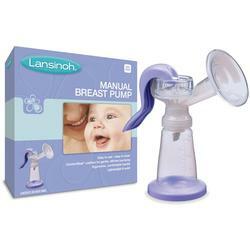 Can I sterilize the Lansinoh Manual Breast Pump parts by boiling in water? After undertaking our standard of continuous boiling is for 100 hours, Lansinoh® confirmed the Manual Pump parts work properly and that there will be no deformation on bottole or any parts after 100 hours of boiling. However, please be sure that no parts of the bottle or attachments touch the bottom or the sides of the pan because this could cause the bottles to melt.